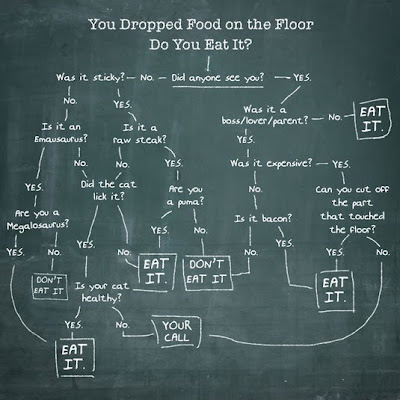 In the gastronomic blogosphere there is a lot of blah blah blah. Here is where I ate last night. Here is the recipe for the blueberry crumble I made. Here is what I think of the White House vegetable garden. But every once in a while I stumble across something truly original, and hilarious. 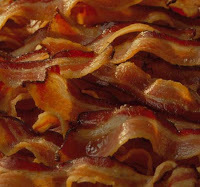 I direct you to this site full of haikus about bacon. Below is my hand at a quick one, but I am just a dabbler. Click through to experience a real pro. When I need you most be here. I went on a first date with a restaurant last night. When we were set up I checked the place out online, Northern Spy Food Co: local, sustainable food at reasonable prices. It seemed too good to be true. Either it was going to be packed, or ugly, or have bad food, or my least favorite wart, nasty service. Maybe I am not ready to try new places again I thought. But I put my coat on and went, and am really glad. I know its early but I may even be in love. I tried not to stare but I couldn't help notice that the place was really cute. Its not all about looks I reminded myself, as my friend Katie arrived. A restaurant has to have more than that to offer. We shared the kale salad to start. Frilly chopped pieces of delicate yet flavorful kale piled fluffully with cubes of cooked squash, clothbound cheddar, and almond pieces. It was slightly heavy on the almonds but the elements combined liked they were meant to be together and the textures yielded some fun chewing which unlocked gradually changing taste experiences with each bite. You make a good first impression Northern Spy Food Co.
Next, Katie had the squid and mussels entree and I had a special of pork meatballs in red sauce. I reached across the table and tried Katie's food. The squid and mussels were light but the navy beans in the dish gave it a little heft and the subtle breadcrumbs lent it a hint of decadence. And the meatballs? A nice balance on the sweet to spicy and dense to squishy scales with a lovely porky flavor. The red sauce, as it should, tasted like tomato and had a good acid level. Often tomato sauce can be like an assault rifle on my esophagus but this was just right. 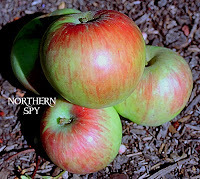 Could you be for real Northern Spy Co? We skipped dessert to spend a little time browsing the shop of artisanal food products in the back. Brooklyn Brine pickles. Anarchy-in-a-Jar jams. Mother-in-law's Kimchi. Consider Bardwell Cheese. And then there is the sin section, a bevy of little homemade confections by the register. I was wooed by the beer pretzel caramel and the chocolate covered graham cracker. How you sweet talk me Northern Spy Food Co. So where is the catch? Is it the service? Not at all. It was homey and genuine and sweet. Was it the price? Not that either. $33 each for the above plus two house-made seltzers, two drinks (one wine and one beer from a good selection of local craft offerings), and a 20+% tip. The little treats we got on the way out were $1 a piece. I'll keep my guard up because this is a tough town, but I can't wait to go out with you again, Northern Spy Food Co. Sit down or take away. Menu. You need to eat. But you also want to help Haiti. So check out these participating restaurants at Dine Out 4 Haiti and do both! Labels: Dine Out For Haiti, Northern Spy Food Co.
An issue that has become very important to me of late is sustainable farming. And I don't mean sustainable farming in the buzz word, bumper sticker, causnik, I'm for puppies sort of way. I mean that in actual practice, we need to transform the food ecosystem through the choices we make when it comes to food. Sustainable farming is a trendy issue these days but one thing many lose sight of is that sustainable farming is not the responsibility of farmers alone. Consumers are an integral part of the food business, in fact its reason for existing, and it is our responsibility to demand food that has been responsibly produced and sourced, and support the producers that meet these demands. We should know where the food we eat comes from and roughly speaking, we should know how it is produced. And we should know, in the case of livestock, if it was raised in the most humane and natural manner possible. You wouldn't drink a cocktail that was made with a bottle that only said "alcohol" in block letters on the label. So too shouldn't you eat something that just says "food" on it, and if you don't know where it comes from, that it is edible is really all you know about it. But, how you ask, in a free market economy, did we get to a place where people actually prefer to buy industrially farmed produce that is laden with chemicals and devoid of taste? When consumers have choice, why do they buy chickens that have been raised exclusively indoors with no room to even turn around? It is a complicated issue for sure, made more complicated by farm subsidies and other government programs, but at the consumer end of the supply chain, a lot of it boils down to a fundamental information asymmetry-- one of those little wrenches they taught you in Econ 101 could disrupt a market's ability to function efficiently. Other than superficial appearance, the only thing consumers really see when they shop for fruit, vegetables or meat at the average grocery store is price. They don't see the impact on our soil and water supplies from farming the way big agriculture farms. They don't see pictures on meat packages of animals raised in barns packed practically wall to wall. Leading with price, and obscuring a lot of other facts, farming industrialists have radically changed our agricultural landscape and in turn, the food that makes it to our tables. I could go on and on about how sustainable farming is better for the earth, better for you, better for animals, and better in terms of taste. Just ask if you're curious. But my point is that it is not in the interest of the big food companies to tell you about where the food they sell comes from. So start finding out on your own and make educated choices. You, the consumer, are the tail that can wag this dog and help reverse a tragic trend in American agriculture and food. Sure, these choices may be more expensive, but how do you really feel about eating a $2 chicken anyway? My suggestion is to choose the good stuff, maybe just a little less of it. To help you on your way to learning more, here are two short videos. Neither was chosen for shock value so don't fear any preachy animal abuse snuff like content. Just some good information. The first video is As We Sow, a short sobering documentary about farming in Iowa. The second is a look into animal farming at Stone Barns, a working farm and agricultural center just north of New York City. Take note of the difference between the pigs in both videos, which ones do you want to eat? "Pants Bomber Causes Grief for Chefs Who Smuggle Salumi into America"
Like most stubborn life-long New Yorkers, I am reluctant to concede there is better anything anywhere else, especially when it comes to food. Certainly regional dishes are best where they originated, partly because of the execution and partly because of the authentic trappings, but there is not much you can't find a great version of in New York. Barbecue, check. Fried chicken, check. New England-style lobster rolls, in spades. And I have never failed to emphasize the superiority of New York's culinary landscape to Dan on our many trips to San Francisco, as we suffered through mediocre meals at restaurants we went to on recommendation. But this time was different. Dan and I go to San Francisco fairly often because his family and many of his friends aren't fortunate enough to call New York home. On each of these trips, I have labored to find good food, only to head back to New York with no strong memories, positive anyway, of anything I have seen or eaten. But even this New York food snob has to give it up to San Francisco for some finds from our most recent trip. Fisherman's Wharf. A fresh crab sandwich for breakfast. What a way to start the day. Dan and I walked through all the stalls and chose the vendor with the tastiest looking crab on the best bread and also tried the crab cocktail. Since it has never been frozen or transported cross-country, the taste is rich and clean, and although we have similar items in New York, nothing here is quite the same. 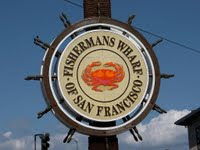 Dungeness crab is indigenous to the west coast and you can't get it much fresher than at Pier 39. And if you go at 9am like we did, there are no tourists to contend with. Bonus. Neighborhood Sushi. Another nice thing about San Francisco is the neighborhood sushi place is probably pretty good. Unfortunately for my wallet, I rarely eat sushi in New York if its not in a top place that has the good stuff such as Ushi Wakamaru or Sushi Yasuda. But in San Francisco, your average sushi place will include premium selections such as kampachi, kinmedai, shima aji, and fish specials from Japan, and is a much better bet than any run of the mill corner sushi joint in New York. A couple I can recommend purely based on the fish are Sanraku and Sushi Groove (yes, somehow places with names like Sushi Groove, which I would avoid here like a new soul food restaurant being opened by Lidia Bastianich, can be total delights there). If you've been to Sebo let me know how it is, its on my list. La Boulange Bakery. Its a chain, but a good one. For brunch or lunch this is a solid choice for good eggs and sandwiches served in a quaint environment that feels a lot more homespun than someplace with 11 units. I particularly like the open face tuna melt with cheddar. Hog Island Oyster Company. We shared 24 assorted west coast oysters and their version of steamers. The oysters were all wonderfully flavorful and so different than oysters on the east coast. Our favorite, which we noted was a little tart upfront and sweet on the finish, was Hog Island's own oysters (you can find these in a handful of NY restaurants but I imagine they lose a little of their mojo in transit). A couple of glasses of champagne, oysters, and a nice view of the Bay Bridge was a lovely way to cap off the afternoon. The next day we were in the mood for a little dim sum but didn't want to have the head-on-a-swivel-looking-for-good-stuff Chinatown experience. We headed to Yank Sing. Solid, clean tasting dim sum in a very civilized setting. Any easy parking too! If your travels bring you the south bay, I really like the Los Gatos Gourmet in Los Gatos. Great sandwiches and a small but quality selection of cheeses and chacuterie. Manresa, also in Los Gatos, is on my list to try for dinner on a future trip. It took a while but now that I have seen that the lights aren't totally broken in the San Francisco culinary tunnel, I look forward to going back and exploring more! He passed in December but I only learned of it this morning. 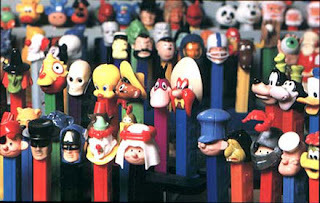 Curtis Allina, the man who brought us the Pez dispenser, died last month at age 87. Since its introduction in 1955, the Pez dispenser has been an important contributor to chronicling our pop culture by rendering some of our most beloved characters in plastic, candy containing form. Mickey Mouse, Yoda, Bugs Bunny, Wonder Woman, and even three different portrayals of Elvis Presley have all been commemorated in a dispenser. There is something very innocent and fun about Pez and I will always remember the dispensers, as well as the fruity candy bricks they serve up, fondly. Thank you, Mr. Allina, for bringing so many smiles to so many faces. "[P.] feels weird every time he orders a 'large black ethiopian' at his local coffee shop." Stay tuned for posts this week on San Francisco dining gems and a showdown between locavore big wigs Alice Waters and Dan Barber.